Dear Lord: Please send Einstein back! We're scared! The author was born during atmospheric weapons testing (1956, to be exact) and is an educational software developer. He witnessed the breakup of the Atomic Energy Commission (AEC) into the NRC and the DOE (1974). He was working at a college news department as Three Mile Island unfolded (1979). He was a computer programmer by the time of Chernobyl (1986). His older brother died of leukemia (1994), then he had bladder cancer himself (2007). Then Fukushima started raining radioactive poisons down on us all (2011). What's next? San Onofre? Indian Point? Or any of a hundred others? Victor Dricks is up to his usual tricks. On Saturday the North County Times ( nctimes.com ) published a commentary by Roger Johnson, asking for IMMEDIATE shutdown of San Onofre Nuclear Waste Generating Station. He got IMMEDIATE action: On Monday the NC Times published Victor Dricks' response! Somehow he had heard about Roger Johnson's commentary and must have worked weekends to counter it. I wonder if he collected overtime pay or just comp time for his efforts? At any rate, congratulations, Roger Johnson! You're scaring them! Below are both items, plus Roger Johnson's excellent follow-up to Dricks' drivel. Dricks response is something only a propagandist could love: He takes exception to practically every word of Johnson's letter and ignores countless facts (as Johnson points out in his follow-up). But what is really astonishing is Dricks' description of the 1982 Sandia Labs study as "outlandish" and "unlikely" when all that's missing is the rainstorm -- we saw all the rest of it already happen in Fukushima Dai-ichi! Three times! Our reactors can explode, just like theirs did. Our spent fuel can burn, just like theirs did. In fact, what happened at Fukushima Dai-ichi isn't over, isn't as bad as it can get, and isn't being fully reported! A recent busload of reporters, finally let in to "see" the plant for the first time since the accident, weren't allowed off the bus, even though they were each dressed in full-body protective hazmat suits, to add to the 480,000 hazmat suits used so far at Fukushima Dai-ichi. The NRC would have you, the public, FORGET FUKUSHIMA DAI-ICHI. More than eight months after the tragedy, Dricks isn't even close to spelling it right, and he won't dare to give the NRC's official estimate of how many people Fukushima Dai-ichi will eventually kill (cancer takes many years to develop). Of course, the NRC doesn't make such estimates. It would be bad for business. The NRC and the nuclear industry wants the public to think that our reactors, spent fuel pools, and dry casks are somehow less vulnerable, less dangerous, and better protected through better regulatory oversight than Japan's were. Fukushima USA nearly happened many times already: At Brown's Ferry in 1975, at Three Mile Island in 1979, at Davis-Besse in 2002, during an earthquake a few months ago at North Anna, from a tornado near Calvert Cliffs a few years ago, and so on. It's just a matter of time before a nuclear plant in America melts down, and there is a 2 in 104 chance it will be one of San Oofre's and about a one in 25 chance it will be one in California -- NOT counting any increased probability due to our nearby seismic faults and tsunami risks, or our aging/embrittlement issues, workforce issues, etc.. It assumes all other nuclear power plants are equally-poorly run, poorly built, poorly maintained, and have their own environmental risks that weren't properly considered. 104 reactors. 104 mistakes. The only way to significantly change the odds is to shut San Onofre down immediately and forever. The longer the fuel has cooled, the safer it becomes, and the less of it we make, the less we have to protect and guard for millions of years. Extremely toxic radioactive waste is created at San Onofre at the rate of about 500 pounds PER DAY. Nuclear energy is a dangerous and costly mistake. It can easily be replaced with cleaner alternatives. Nuclear power is profitable for a select few, who use official mouthpieces such as Victor Dricks to lull the public into accepting the enormous and unnecessary risk nuclear power presents. But Dricks' lies can't change the facts. His resignation should be demanded by all citizens who want their paid servants to tell the truth. When people moved to North County, they knew about the San Onofre nuclear power plant and accepted it as a necessary evil. The meltdown at Fukushima last March changed everything. Fukushima is now an uninhabitable dead zone, and some experts predict that eventually a million people all over Japan may die from Fukushima radiation. Everyone is now reassessing their stance on nuclear power. Solana Beach is taking the lead in San Diego County with a public hearing set for Nov. 16. San Clemente already conducted three town meetings called, "The Lessons of Fukushima." Meanwhile, Southern California Edison (operators of San Onofre) is gearing up for a 20-year license renewal application. Like Fukushima, San Onofre has aging reactors vulnerable to equipment failure, human error, earthquakes, tsunamis, sabotage, and terrorist attack. The NRC (Nuclear Regulatory Commission) has warned that a meltdown could cause 50,000 fatalities and hundreds of billions in unrecoverable property loses. How far could the radiation spread? Until Fukushima, the evacuation zone was 10 miles, with an ingestion zone of 50 miles (all food and water as far as San Diego could be contaminated). But when the U.S. government saw the winds in Fukushima turn inland (as they do here all the time), it ordered evacuation within 50 miles. There are 8.4 million people within 50 miles of San Onofre (everyone between San Diego and Los Angeles), and anyone who imagines that they are safe had better think again. The problem with radiation is that it cannot be seen, heard, tasted, or smelled and can silently penetrate all objects including lead, concrete, and steel. Trillions of microscopic particles can contaminate food, water, soil, plants, clothing, pets, and everything you own. A millionth of a gram of plutonium 239 can be lethal. No, there will not be a nuclear explosion, but those exposed may get some form of deadly cancer. Pregnant women and children are especially vulnerable. Even more dangerous than the material inside the reactors are the radioactive fuel rods stored outside the reactors. These 2,500 fuel rods have the equivalent of thousands of Hiroshima bombs. Because Yucca Mountain is closed, San Onofre will remain a huge nuclear waste storage facility until the plant is closed. Evacuation is no solution. A large earthquake would make roads impassable and thousands could be stuck in cars absorbing even more radiation. The NRC says it is concerned with public safety, but in reality the NRC is part of the nuclear industry. The industry picks the commissioners, and the funding comes from the utilities it is supposed to regulate. The NRC has made relicensing of San Onofre easier by grandfathering the plant to make it exempt from modern safety standards. This is especially troubling because San Onofre has one of the worst safety records in the U.S.
San Clemente unanimously passed resolutions demanding new seismic studies and the removal of nuclear waste before there is any relicensing. It is now time for towns in North County to examine this issue and recommend even stronger action: Close the plant immediately. Roger Johnson was on the faculty of Amherst College, Tufts University and Ramapo College and is now professor emeritus residing in San Clemente. In his commentary calling for the immediate closure of the San Onofre Nuclear Generating Station published Nov. 12, Roger Johnson, a professor emeritus residing in San Clemente, said a Nuclear Regulatory Commission study predicts 50,000 fatalities in the event of a catastrophic accident at the plant. While he cites no reference, we believe Mr. Johnson was referring to "Technical Guidance For Siting Criteria Development." This report, prepared for the NRC in 1982 by Sandia National Laboratory, was not an effort to determine how many people might die or how much property might be damaged in the event of a severe accident. It was an effort to determine how large a role factors like population densities, meteorology, geography, and emergency planning could play in the consequences of a nuclear accident. It used a hypothetical scenario in which all of the plant's safety systems and barriers fail, spouting a radioactive geyser into the air. The entire contents of the reactor core get injected into a rain cloud hovering above the plant, and the cloud then floats over a major population center where it drenches a population with radioactive rain. The scenario is so outlandish and considered so unlikely, the people who designed the study said at the time they doubted it could occur. Despite numerous explanations and clarifications by the NRC over the past three decades, this study has been misused by many. Mr. Johnson also noted that San Onofre "has aging reactors vulnerable to equipment failure, human error, earthquakes, tsunamis, sabotage and terrorist attacks." The NRC has rigorous requirements for the design and operation of nuclear power plants that ensure that they are built to rigorous standards, operate safely, are capable of withstanding all manner of natural hazards and are secure from terrorist attack. The agency holds the industry to a high standard, and our inspectors have a low threshold for concern. Our regulations require multiple safety barriers and "defense in depth" to protect the public from exposure to radiation. Our rigorous oversight ensures that adverse performance trends are identified long before they become safety-significant. After the accident at Fukushima Diaichi, the NRC conducted inspections at all 104 reactors to ensure they could deal with the loss of major equipment or electrical power following extreme events. Some deficiencies were identified at San Onofre, but nothing that would have prevented the safe shutdown of the plant. * Contrary to Mr. Johnson's assertion, the industry doesn't pick NRC Commissioners; the president of the United States does, and they are confirmed by the Senate. * Yucca Mountain is not closed; it was never built. * The used fuel rods at San Onofre do not "have the equivalent of thousands of Hiroshima bombs;" they are being safely stored in a water-filled pool or are transferred to massive steel and concrete storage casks. * And the industry does not pay for the NRC; fees charged to the industry for safety oversight are sent to the U.S. Treasury. Victor Dricks is a public affairs officer for the Nuclear Regulatory Commission and is based in Arlington, Texas. Copyright 2011 North County Times. All rights reserved. This material may not be published, broadcast, rewritten or redistributed. The NRC (Nuclear Regulatory Commission) in Texas has seen fit to respond through public affairs officer Victor Dricks to my Forum commentary of Nov. 12 in North County Times asking for the closure of the dangerous San Onofre nuclear power plant. One of my major arguments was that the NRC is actually part of the nuclear industry despite its claim to be an independent agency of government concerned with protecting the safety of citizens. The vigor with which Mr. Dricks attacks my commentary together with his enthusiastic support of the nuclear industry speaks volumes for the true interests of the NRC. Mr. Dricks demeans the Sandia National Laboratory study in 1982 which predicted 50,000 deaths in the event of a meltdown at San Onofre. The population of this area has grown by a third since that study and the estimated death toll would now be far higher. It seems disingenuous for the NRC to cherry pick studies of the U.S. Dept. of Energy National Laboratories and pick reports which glorify nuclear power and criticize those that warn of the dangers of nuclear power. My commentary was limited to 500 words and I could not mention many additional studies including those that predict a million eventual cancer deaths in Europe from Chernobyl and in Japan from Fukushima. Mr. Dricks boasts about the âœrigorous standardsâ of the NRC, yet he fails to mention that the NRC compromised these standards for the purpose of promoting the relicensing of San Onofre. The fact is that the NRC went out of its way to protect San Onofre from meeting the safety requirements of new nuclear power plants. This illustrates the embarrassing fact that a major priority of the NRC is to protect aging and dangerous plants from closing. With regard to Yucca Mountain near the California border, it was first recommended by the Dept. of Energy in 1978 and in 1987 President Reagan approved it being one of the top three destinations for nuclear waste. In 2002 it was approved by Congress and signed by President Bush. The facility will end up costing taxpayers $11 billion. It is outlandishly deceptive of Mr. Dricks to claim that Yucca Mountain "was never built." Mr. Dricks is technically correct that the President picks the NRC commissioners. What he doesnâ™t say is that all commissioners are first vetted by the nuclear industry. No commissioner is ever nominated let alone approved unless he or she is already a proven cheerleader for the nuclear industry. Mr. Dricks employs more deception when he claims that the NRC is not funded by the nuclear industry. The fact that the money trail goes from the industry to the treasury back to the NRC means only that the NRC is doing summersaults trying to conceal its actual funding. The NRC representative at the San Clemente hearings was quick to admit that 90% of NRC funding comes from the nuclear industry. Finally, Mr. Dricks claims that highly radioactive nuclear fuel is safe because it is in pools or in temporary concrete casks. If anything goes wrong with the pumps, pipelines, switches, valves, power supplies, or concrete pools, we have a nuclear catastrophe. The Veterans Today Military and Foreign Affairs Journal reported that the radiation released by Fukushima is the equivalent of 66,000 Hiroshima atomic bombs. Finally, I take offense that Mr. Dricks wrote that my commentary was peppered with inaccuracies when in fact it is his commentary which was full of inaccurate, misleading, and deceptive statements. The truth is that the NRC is an out-of-control agency which cannot be trusted. The fact that the NRC is so deceptive and unprincipled in its rush to promote nuclear power should be of major concern to everyone. 11/11/11 is Veteran's Day in America. Veteran's Day was originally created as Armistice Day, to be held in commemoration of the end of The Great War and to promote the cause of world peace. But war did not end, and in 1954 Armistice Day officially became Veteran's Day, and became dedicated to honoring those who sacrificed for the cause of peace, rather than being dedicated to the cause of peace itself. World War One ended on the 11th hour of the 11th day of the 11th month of 1918, so Veterans Day is always on the 11th day of the 11th month. Could World War One have ended a day sooner, or maybe an hour sooner? It would be another half century, and another war, before a young veteran, John Kerry, pondered the question: "How do you ask a man to be the last man to die in Vietnam? How do you ask a man to be the last man to die for a mistake?" My father, Howard S. Hoffman, became a Quaker in his mid 30s and is now buried in a small Quaker cemetery. Howard was a peaceful man: A scientist, a college professor, a musician, a painter, an author, and most of all (from my perspective) a loving father. My step-mom, also a former college professor, is a Quaker pacifist. Despite her years, she has been attending the Occupy Philadelphia rallies. She protests war, nuclear weapons, nuclear energy, and the destruction of Social Security, which her father, Nelson Cruikshank, helped establish in the 1950s and '60s. My father was not born to a peaceful time. He fought and killed with the best of them: As an American soldier during World War Two. Shock and Awe had been invented. Howard fought the Axis forces throughout Europe, pushing the Germans back a yard, a mile, a battle and a town at a time. More than a year after Cassino, he was trudging through icy, snow-covered forests in Belgium during a German offensive that later became known as The Battle of the Bulge. My father's company came upon a place called Malmedy, where nearly a hundred American prisoners of war had been machine-gunned in cold blood (and cold weather) by German soldiers of the 1st SS Panzer Division, then left to die in the snowy fields. Hitler had ordered no quarter be given, no prisoner be taken, no civilian be pitied in the attack. The ill-conceived offensive was to be swift and brutal. It was. Within a month, nearly 100,000 soldiers on each side were killed, wounded, or missing -- and thousands more civilians had also perished: Buried under rubble, shot by stray bullets, mistaken for a soldier, or starved or frozen to death in their homes. After The Battle of the Bulge, it is doubtful many Germans thought they could win the war. It was just a matter of time before their inevitable defeat. Did Germany stop fighting? Hardly! Did German soldiers stop committing atrocities? HARDLY! Howard came upon a place where the Germans had burnt a barn full of civilians. They were too difficult to move as swiftly as the Americans were advancing. The Americans had seen the smoke rising for days. Today the world still has little trouble starting a war, and we seem no better at ending them, either. If the atomic bomb had been ready while we were still at war with Germany, would we have used it there? Did we use "The Bomb" for demonstration purposes more than anything else when we bombed Hiroshima, and then Nagasaki (as a demonstration to Russia, specifically)? Was the demonstration effective? What did we demonstrate -- that civilian populations will never be safe from war again? That a sudden escalation of war may come at any time, even when it appears to be the eleventh hour of a war everyone knows must end soon? That global pollution is now an inevitable consequence of war? That we've got The Bomb, now go get one yourselves? They did: Russia, England, France, China, India, Pakistan, North Korea, Israel too it's believed, and perhaps Iran now, too. Why does it take so much violence to stop violence? Or does it? Is the use of overwhelming force against a weaker enemy justifiable? If so, is the use of overwhelming force operated entirely by remote control equally justifiable? When will war itself become a war crime? Do the actions of a small group of terrorists mostly from one country against another justify destroying the entire civilian infrastructure of a third? Who owns the oil and other riches beneath their feet, or the air we all breath, or the water that runs by, unpolluted? When a veteran comes back from combat duty with no visible wounds but a head full of mental problems, what should society do? Have a parade? Or have police in riot gear beat him when he protests the greed of the 1%, pepper-spray and tear-gas him, and then arrest him for "assaulting a police officer"? Is this what democracy looks like? Is this the peace our veterans fought for? Dust storms created in the African deserts are clearly visible on satellite images thousands of miles out over the Atlantic ocean, and they are even visible to the naked eye in the West Indies when they pass over -- and settle out -- there. Insects far larger than a fuel flea are carried aloft -- and alive -- for thousands of miles through the air. It doesn't take a scientist to know which way the wind blows. My wife and I attended the public portion of the National Academy of Science's meeting on the current state of epidemiological studies of low level radiation dangers from nuclear power plants, held in Irvine this past July. Scientists from several different countries were Skyped in. Others appeared in person. A scientist from the Hiroshima bomb study group was one of the presenters. I didn't see any representatives from San Clemente there to make a request that their community receive extra scrutiny. Although San Onofre Nuclear (Waste) Generating Station had several employees present, none spoke. The only members of the public to speak during the opportunity provided were my wife and myself. When I spoke, I mentioned that although I'm not an "expert", I have programmed a statistics tutorial (written by my father, who taught statistics for nearly fifty years) and it's currently used by students in over a thousand universities. I said that: "I can program a two-way Analysis of Variance [an 'ANOVA', a standard statistical analysis technique] in three different computer languages". I then said that the overriding theme of the day seemed to be that reliable statistical data regarding cancer clusters around nuclear power plants is very difficult to collect. I pointed out that no definitive results have come after more than half a century of research, and none are likely in the near future, because everything is going to be drastically under-funded, short-term, small scale, half-measures, and, in the end, ANY results will invariably be considered unreliable, because the results will be full of possible confounding factors. I added that I hadn't heard the word "Fukushima" all day, where theory has turned to gruesome reality. Afterwards, in a conversation with the scientist who I felt had presented the most pro-nuclear views of the day (I tend to gravitate towards those people, for information, but in this case I just plain liked his style and his honesty), I was told that after a lifetime of research, he has NEVER found the slightest proof that "hot particles" are any more dangerous (that is, cause proportionately more cancers) than the same amount of radiation delivered as vapors or any other way (what organ is targeted by the radioactive isotopes is far more important, for example). I was also told that yes, we're a long way from knowing for sure if "Linear, No Threshold" is correct, and in a hundred years, we probably still won't be sure. But we'll be closer to being sure. Like you, I'm not a scientist, either. But like you, I know what a plume of poison gas can do. I know what happened in Ypres during World War One. I know San Onofre was partially evacuated today because of non-radioactive poison gas. I know that "LNT" is the accepted scientific theory, and has been for decades, and according to that theory, Fukushima IS poisoning us all. And so is San Onofre. Whether its daily releases are significant or not can be debated forever, because it will be long closed before definitive data exists, if the NAS meeting is anything to go on. But San Onofre's vast potential for suddenly devastating San Clemente, Carlsbad, and all points in-between, and much farther out too, is undeniable. My educational software, that I wrote, and/or programmed, is used by scientists and engineers all over the world. My animation of a Fukushima-style reactor, done several years ago, is so accurate that it's used for training in reactor engineering classes, by emergency responders, and by the nuclear industry. 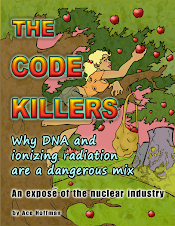 My book, The Code Killers, has been out for three years, and I've begged for anyone to make corrections, and I've put it in the hands of dozens and dozens of San Onofre employees -- every one of whom has been polite thus far, by the way. Some have even said they've enjoyed reading the book. None have been able to disprove its conclusion. During the NAS session, the KIKK study from Germany was talked about quite a bit. That's the study cited by Helen Caldicott on October 11th as one of the cornerstones of the current epidemiological debate against operating nuclear power plants. But in Irvine, conflicting results of an apparently more complete study were presented. But the "more complete" study wasn't very good, either! I don't refer to the KIKK study to support my opposition to nuclear power, I don't need to. Nuclear power doesn't make sense anyway, even if it DOESN'T double the likelihood of childhood leukemias among those living nearby. I don't recall that the Chernobyl Consequences book (translated in 2010 by my friend Janette Sherman, who is a medical doctor and radiation expert) was mentioned at all during the NAS hearing. I read that book very carefully shortly before publication, with the eye of someone who can program any basic statistical function, and I was absolutely aghast. Aghast, not by the lack of scientific credibility of each individual study, many of which had essentially none whatsoever, but by the overall emotional effect of reviewing the results of THOUSANDS of studies. THAT had impact. The author's conclusions -- that Chernobyl appears to have already killed nearly a million people -- seems very, very plausible. But there will be no proof. Even a hundred years from now, there will be little "scientific proof" that Fukushima killed millions, including thousands in California alone, but it will. Exact numbers are impossible to find, but as late as August, 10 trillion Becquerels of radiation were still being released every hour at Fukushima. The half-lives vary from seconds to days to centuries to millennia. All that radiation IS going to kill people all around the world for generations to come. That's the nature of LNT, combined with massive releases of poison gas. It doesn't take a scientist to know this. You and I are both qualified to know that San Onofre can do the same thing -- release massive amounts of poison gas -- in a heartbeat. San Onofre can lay waste to San Clemente for generations, starting today. You and I are also fully qualified to know that if they shut the reactors down, many of the "routes to catastrophe" are immediately eliminated, and additional fission products are no longer being created once criticality is stopped. We are qualified to assess the fact that in 65+ years, the so-called scientists have not solved the waste problem because ionizing radiation destroys ANY container you put it in -- by definition. And for that matter, we know that "finding a place to put it" isn't the same as solving the problem anyway! Lastly, we can plainly see that all the "experts" in the world can't put Fukushima together again -- or even stop it from going critical again right now! We are all experts in one thing: Ourselves. We each have a right to try to protect ourselves and our loved ones. We each know it is also our duty to live in peace on this earth, not to harm others, not to leave anything but daisies popping up from our graves, and a good impression among those we influenced during our lives. Highly irradiated workers, as happened in Idaho some years back when one was impaled on the ceiling of a building by an ejected control rod, have to be buried in lead-lined coffins, and even then, it's a inadequate solution. It does not take a scientist to know that there are cleaner energy alternatives. If two scientists want to argue whether coal or oil is worse than nuclear, so be it -- let them argue. In the meantime, any economist worth their title can tell both scientists that there are vastly cleaner alternatives than either coal, oil, or nuclear, available to San Clemente's residents, and for everyone else, too. There is nothing good about nuclear energy. Prolonged debate over exactly how bad an idea it actually is, isn't necessary. The facts are overwhelmingly against nuclear power, and were before San Onofre was ever built, and long before the chickens came home to roost in Fukushima. We can hope and pray Fukushima doesn't happen here, but that's not being very scientific. Instead, we can make it IMPOSSIBLE to happen here, by shutting the plant down, removing the waste, and turning to clean energy. If we can't remove the waste today, that's no reason not to shut the plant down and switch to clean energy. Two out of three ain't bad. For now. >I have corresponded with Mr. Kaltofen about his findings, and there is actually no scientific paper to accompany the announcement right now - just a summary page and a powerpoint. The final paper will actually be Mr. Kaltofen's doctoral thesis for his PHD - no word on when that will be available. >As there is not data to confirm the hot particles, just a powerpoint, the video presentation is somewhat premature. I have no doubt at some point I will receive the paper, which should be subjected to peer review and analysis before making broad statements of confirmed facts. I am not a scientist, but I do believe in the scientific process - which we should stick to when making decisions and reviewing the facts here. >I am also copying the City Manager on my response in case he feels the Council may benefit from the findings. >I believe the important thing, from Tim's perspective, is that it's usually pronounced "wooster" (with the "oo" pronounced more or less as in the word "wood" (not "rooster")), although when locals denounce their city, the first part is pronounced more like "wus". >Can anyone dig into this so we can respond to Tim Brown. You can respond yourself or get back to me and I will reply to him since I passed this video on to the council. >The video is nice as is the website on APHA - but there is not scientific paper available for review. I have emailed Mr. Kaltofen for the original. He is currently studying at Worcester for his PHD, I believe this is his dissertation. Having tracked this pretty closely, his results are not typical - particulary when compared to UC Berkley's findings. I would be interested to know who is wrong here. >I would be interested more in this paper once it has been peer reviewed. You may also want to email Mr. Gunderson and let him know that it is Worcester Polytechnic and not Worchester Polytechnic. >Washington, DC - October 31, 2011 ­ TToday Scientist Marco Kaltofen of Worchester Polytechnic Institute (WPI) presented his analysis of radioactive isotopic releases from the Fukushima accidents at the annual meeting of the American Public Health Association (APHA). Mr. Kaltofenâ™s analysis confirms the detection of hot particles in the US and the extensive airborne and ground contamination in northern Japan due to the four nuclear power plant accidents at TEPCOâ™s Fukushima reactors. Fairewinds believes that this is a personal health issue in Japan and a public health issue in the United States and Canada. To give you some idea of how bad the worst industrial accident in human history actually is, a team of international experts recently concluded that the Fukushima Dai-ichi nuclear catastrophe has already released 2.5 times as much radioactive Xenon-133 (a noble gas) as was released by the Chernobyl catastrophe -- the previous worst industrial accident. Both accidents are ongoing: Chernobyl's poisons will be emitted for thousands of years, and so will Fukushima's. Fukushima is still spewing radioactive poisons by the terabecquerel (a technical term for: A lot). Chernobyl's effluents are somewhat better contained, although Chernobyl's precarious sarcophagus is in need of immediate repair. But bad as things still are at Fukushima after the March 11th, 2011 earthquake and tsunami (and numerous mechanical and human failures, too), things can get MUCH worse at Fukushima. Unit #4's Spent Fuel Pool contains the equivalent of about three fully-fueled nuclear reactors: 1,331 fuel assembly bundles. And because of structural damage from the March 11 earthquake and tsunami, plus an explosion in the reactor building housing the SFP on March 15, and numerous earthquake aftershocks, Unit #4's SFP is even more precarious right now than Chernobyl's sarcophagus. Some of the fuel assemblies are extremely radioactively "hot" since the reactor itself was emptied entirely in December 2010 for extended maintenance. They take a minimum of about five years to cool enough to be removed from the pool. It's way too soon right now. But if an accident (caused by an aftershock or a new earthquake, for instance) causes the Unit #4 Spent Fuel Pool to drain -- which nearly or partially happened, but things are sort of stable right now -- ALL of the fuel in the pool might catch fire and burn. This could approximately double the size of the Fukushima releases so far! Below, Gordon Edwards, from the Canadian Coalition for Nuclear Responsibility, describes the dangers to Unit #4's SFP in more detail, and proposes an international team be immediately convened to secure the site better. The efforts necessary are agonizing processes, which will take an agonizing amount of time to accomplish. And they won't be cheap, which may be the main reason they are not being done. But they MUST be done! the nuclear fuel from soaring out of control. releasing large quantities of radioactive gases and vapors. and providing a pathway for radioactivity to escape into the atmosphere. climb, and the irradiated fuel will overheat and may even catch fire. capable of withstanding the most severe imaginable aftershock. seek help from outside, but sometimes it is the best thing to do. nuclear division of Ontario Hydro (now Ontario Power Generation). any foreseeable earthquake or other stresses they may be subjected to. damaged further complicates the procedure. strong and secure as possible. Tonight some of the greatest minds on the planet will gather electronically, physically, and/or spiritually, to try to explain nuclear power to the public, to city leaders, to state officials if they show up, and to the media. Presenting tonight [October 11, 2011] will be Helen Caldicott, Dan Hirsch, Arnie Gundersen and Bill Perkins. If all goes according to plan, the public will have many chances to speak, too. The event? A city-sponsored information presentation. This is a follow-up to the September 27, 2011 hearing held by the city of San Clemente (nearest city adjacent to San Onofre Nuclear Waste Generating Station (SONWGS)). The previous hearing included Southern California Edison and the Nuclear Regulatory Commission. It was a white-wash. This won't be. SONWGS, also called SONGS by those who ignore the hazardous waste it produces, is in the process of being shut down by the citizens. I'm sure we will win. But afterwards, San Onofre will leave a costly legacy for the human race to have to handle for hundreds of thousands of years. The legacy is the "spent" fuel. Don't let names used in the nuclear industry fool you -- "spent" fuel isn't "spent" at all, it's lethality has been greatly ENHANCED -- by a factor of perhaps 10 million times! Thus, one pellet is now as dangerous to human life -- to all life -- as ten million pellets were BEFORE they were placed in the reactor and bombarded with slow neutrons. And even that is too much -- the standard should be made more stringent. Tritium also leaks from every reactor, uncounted and unreported, and it is only one of THOUSANDS of types of radioactive isotopes released from EVERY nuclear reactor all the time. So-called "spent" fuel is the most hazardous stuff on earth. We make it, but we have no place to put it. What was once raw ore in the earth, was first processed into a ceramic pellet and still not very hazardous but no picnic, has become a problem with no solution -- a hazard so lethal you can't stand next to it without many feet of steel and concrete, or lead. You can't use it for anything. It would cost a fortune to try to get rid of by trucking it somewhere (no one wants it), rocketing it to the sun (way, way, WAY too risky and equally too expensive), burying it at sea (uh oh, that's been tried, it failed miserably...) or anywhere else... nobody wants it, no place on earth is stable enough, far enough away from people and wildlife, isn't a source of drinking water or anything else we need (such as minerals), and yet is somehow close enough that we can safely transport the waste from hither to yon a hundred thousand times across the country, and many thousands of times from San Onofre Nuclear Waste Generating Station alone. The dry casks are carefully sealed up. That is, they are ready to burst into flame at the slightest trouble -- such as an airplane strike by accident (they are DIRECTLY under several jet airliner routes) or on purpose. Or such as an earthquake stronger than they predict, and a tsunami (which could provide the moderator needed to slow the neutrons down, and allow a criticality event in the spent fuel after an earthquake jostles them together, in this writer's opinion). So come to this hearing. Learn why babies are perhaps a hundred times more susceptible to radiation's dangers than adults (yet the standard reference for calculating radiation's dangers to a population are adult males -- the LEAST susceptible of all populations!). Learn why fetuses are perhaps a thousand times more susceptible to radiation's dangers -- because their cells are differentiating and determining their future, adult's cells are already specialized in their function. Learn about nuclear power. And learn why so many experts want to shut it down forever. It is difficult to imagine anything we could ever bring to the region that will be more important than the meeting on Tuesday, 10/11, 6:30 pm at the San Clemente Community Center, 100 Calle Seville. Some of the world's best known Nuclear Experts that are not on the payroll of the nuclear industry will be presenting an entirely different perspective regarding "Implications for San Onofre Nuclear Generating Station from the Disaster at Fukushima". At the same meeting, you'll learn about the safe, renewable technologies that await exploitation. Cost effective and economically stimulating options abound. We see this as an emergency, and we believe you will too, once you better understand our vulnerabilities and opportunities to change course ASAP. A large earthquake is overdue by 150 years and is expected to exceed the design basis for San Onofre. This is only one of many potential causes for a meltdown at this particular plant rated the second most dangerous of all 104 in the USA. It will take at least five years from the date we shut it down until nuclear waste can be stored in much safer dry casks as recommended by the Nuclear Regulatory Commission. While shut down, we will only need to make up for 6.5 percent of our electricity. We can immediately begin the quest in earnest for a truly sustainable future. You can't begin to imagine the effort some of your fellow citizens have gone to in bringing such an important meeting together. Now it is up to you to actually benefit from all of this effort by showing up and bringing friends to get the latest information about our nuclear power plant. Help us spread the word. Learn about important considerations the industry often glosses over so you can make informed decisions and encourage our city council to do the same at their next regular meeting at City Hall on 10/18. "There are about 1 * 10^4 Curies in a gram of tritium. 1 curie is 3.7 * 10^10 decays per second, so that's 3.7 * 10^14 dps per gram. There are about 3.7 * 10^11 stars in the Milky Way -- a thousand times LESS than the number of decays per second emanating from a single gram of San Onofre's so-called "safe" tritium. " Shut 'em down! Shut 'em all down NOW! But don't for a minute think that Fukushima was as bad as it can get! It was bad. It was under-reported how bad it was -- and is. But Fukushima could have been worse -- and still might be. In fact, it still probably WILL get worse -- when the corium (reactor cores, melted into blobs) start hitting the water table. At that point, Fukushima will get worse. But there are other ways things can be worse than Fukushima is already. For example, the entire core of the reactor can be blown to vapor, hot particles, fuel fleas and bits of corium in an instant (it's called a "core rubblization"). This can happen to any nuclear reactor anywhere in the world. Is it likely? No. Is it possible? Yes. Would it take an extraordinary sequence of events to happen? Yes. Calling for increased regulatory oversight in light of Fukushima, calling for increased safety, calling for increased "margins of error" -- all these won't do much more than loosen up the tight packing in the spent fuel pools -- and increase the dry cask storage capacity from beyond intolerable to whatever comes after that. They might add additional battery-backed up electronic monitors for the water levels and temperatures in the spent fuel pools (gee, you'd have thought they already did that, wouldn't you?). They might have to purchase a fire pumper truck to keep on hand at every reactor site -- not to put out fires (though it can be used for that, too) but to pour water on the reactors or spent fuel pools if needed. They might require eight full hours of battery backup power for each reactor, instead of just four. They might require that radiation monitors be "hardened" to survive hydrogen explosions, and have battery backup in case of "Station Black Out" (SBO), a danger they practically never considered before Fukushima. They might store an extra diesel generator on the West Coast somewhere, to be used by seven different reactors in case of emergency (I wonder how they decide who will get it if two places need it?) Similarly, a few diesel generators will be "strategically located" to provide mutual backup for all the other 97 reactors around the country. That's all the "increased safety" calls will ever accomplish. Little steps. All good, but none decisive. Fukushima, USA will still come if these are the kinds of steps America will be taking in light of Fukushima, Japan. You can be sure that even with all these improvements, nuclear power will still not be able to get insurance. The despicable Price-Anderson Act will not be rescinded. To make things truly safer, we MUST shut the plants down. And even that doesn't guarantee safety. Only moving the waste to an isolated location (which doesn't exist) AND shutting the plants down gives us any sort of reasonable guarantee, but then you still need: A safe way to store the waste (doesn't exist), and a safe way to transport it there (also doesn't exist). The tragedy at Fukushima happened because the plants were operational and because fresh, hot fuel was in the spent fuel pools. Not that dry casks can't have problems just as fierce: In my opinion, a jetliner crashing into the line of dry casks here at San Onofre Nuclear Generating Station a few miles from where I live, for example, could conceivably cause a CRITICALITY EVENT which would DWARF FUKUSHIMA. The casks can be rearranged to prevent that (it's a bit like rearranging the deck chairs on the Titanic) but there are still other dangers to dry casks which need to be addressed. But at least the full spectrum of accidents possible with an operating reactor can't happen IF we shut the plants down. A pro-nuker in a debate I watched recently hit the nail on the head about what the REAL problem is: Once a nuke is built, it becomes a cash cow for the utility that operates it. Once it's built. New nuclear power plants aren't financially viable in America (without massive government subsidies), and new nuclear construction isn't even allowed in California until the impossible happens -- the nuclear waste problem is solved. So instead, we have old nukes across the country, with hoped-for 40 year lives being extended to 60 years, and if they haven't melted down by then, 80 years, then 100 and 1000. Sooner or later, leaving these old deathtraps running is what will kill us by the hundreds of thousands, ruin our lifestyle, and poison our land, air, and water forever. Shut-down isn't a guarantee of eternal safety, but it's a huge step in the right direction and stops us from increasing the size of the problem every day. Across America the problem of "spent fuel" piling up with nowhere to put it increases by about 10 tons PER DAY. It is impossible to make a totally safe nuke. It is impossible to find a totally safe storage place for the waste. That's why the concept of "probabilistic risk assessment" is used to justify nuclear power. But all such calculations are based on faulty assumptions and wishful thinking by those desiring to promote the industry -- and being paid to do so. The "passive" emergency cooling systems promised for the next generation of nuke plants MIGHT work... but they might not... especially if an airplane crashed into the facility. It is impossible to make a totally safe nuke. Even if the nuclear power plant operates perfectly for its entire life -- which has never happened and never will -- it creates an enormous hazardous waste pile which cannot be safely or economically contained. Every nuclear power plant is capable of an accident which can dwarf what happened at Fukushima. When that happens, it will be very difficult to analyze what went wrong! They still haven't figured out what happened at Fukushima almost seven months later, or what's happening there at this moment. Yet still, the pronukers insist that increased safety measures are all we need. They point out weak spots in the Japanese latticework of regulations and claim that America's system is better. But in March of 2002 Davis-Besse nearly did what Fukushima did in March of 2011, without any act of mother nature except rust (and rust never sleeps), and there have been numerous close calls before and since -- perhaps less dramatic than a football-sized hole in the reactor pressure vessel head, as happened at Davis-Besse, but no less dangerous. Fukushima can -- and will -- happen in America. And when it does, we will no longer be a first-world country. We will be a pitiable, poverty-stricken, has-been nation of mutants, debtors, the diseased and the dying. Just like Japan is now. Oh, you don't think so? Look more closely -- look past the official reports, past the main stream media, and read about the abortions, the suicides, the deformities that are showing up everywhere. Weep for Japan today. Weep for us tomorrow. techniques. Wikileaks. Well, okay, it's not all bad! what they were back then. the original Subject given above. I'm sorry to say I stand by them today. brought down too, you would have called me "Chicken Little". likely the fires they started. to withstand the impact of a 727, which is even smaller than a 707.
inside the containment dome WILL release radioactivity to the environment. targets, and thus add significantly to the danger at those facilities. vulnerable. And don't call me Chicken Little. to say it came as a complete surprise. Very little should surprise us now. This description of "current" events out here in California had me in stitches and hopefully will "brighten" (or at least "electrify") your day, as well. And it drives home a lot of vital points at the same time. Thanks, Jerry, for sending it around! >Stop laughing. It just happened. >It wasn't a terrorist plot, or dive bombing sea gulls. >Not an earthquake, or tsunami. >Just one zonie-tech, screwing up big time. >nuclear reactor's apple cart. Just one. >paradoxically thought provoking, and ironic. >"SHUT SONGS NOW!, before it's too late,"
>when suddenly our prayers were answered. >a picture perfect, late-summer morning. >not a genius, to squelch a nuke plant. >Let's NOT start SONGS up! >power source when we need one. >Let's keep it that way. It looks like everyone survived the Great San Diego Black-Out of 2011. I didn't even notice there was a black-out at first, other than the printer going off while I was trying to print protest books against San Onofre Nuclear Generating Station. A group of us formed up post-Fukushima, and we're going places and raising awareness. And we need books -- lots of books! People are pretty ignorant about the dangers, even post-Fukushima. There's a lot of information being kept from the public and misinformation being presented to them. San Onofre didn't help at all to keep the power on when the grid went down. Instead, they had to shut down themselves! Supposedly this was because "they had no place to send the power." That's how the spokesperson for the plant describes it. But I would say it was because they had no offsite power coming INTO the plant! That's what probably really shut the plant down. But one way or the other, here's the obvious thing: San Onofre is not helping. Thanks for your help, SONGS -- NOT! About one and a half million homes -- five million people -- were without power for at least six to eight hours yesterday and today, and many of them are still without power. There WAS a seven-car pile-up on I-5 (the main freeway that runs near San Onofre), which shut it down in both directions, and I-5 was shut down heading out of San Diego elsewhere at the same time -- it was a mess! But I was prepared -- or so I thought. When the printer went out, my UPS beeped and the front panel lit up. Those were my clues that five million of us were in the dark. I paid little attention, being in the middle of writing a newsletter about what an atom is, an alpha particle, a beta particle, a gamma ray, a half-life, and so on. But then the UPS beeped again, and the print job was clearly not running (the printer pauses now and then anyway, for some reason), so I went upstairs and checked the printer, and it was completely off and the on/off switch wouldn't do anything. So then I started to grasp that there was a blackout, and shut down the computer so that I wouldn't drain the UPS battery just in case I needed it. I tried to count up all the ways I wasn't prepared for real trouble -- like, a meltdown at San Onofre because of the "Station Black-Out" conditions (the same as occurred at Fukushima after the earthquake and tsunami, but minus the earthquake (which actually started the inexorable sequence that led to meltdown of the three reactors in Japan) and minus the tsunami (which is blamed for the meltdowns, but apparently was NOT responsible -- it was the earthquake). We have earthquakes here, too. Bad ones. Right near San Onofre Nuclear Generating Station. Small-scale distributed renewable energy is a much safer way to power the grid. In an emergency, nuclear power is unlikely to be there to help at all! We've seen this now, time and again. And the traffic! Oh, the traffic! Because the traffic lights were out everywhere, it took my wife more than an hour to get home, normally a 12 minute drive in clear traffic and a 20 minute drive at rush hour. The 60 or so trolleys in the city of San Diego all stopped at the same time, and only a couple of trains ran, so if you missed them, you missed them. Could we evacuate five million people if San Onofre Nuclear Generating Station melted down? No! Can San Onofre melt down? In a heartbeat. It's useless, wrong, and crazy to continue risking the enormous death and destruction that would accompany an serious accident at San Onofre. Trapped as we are with only a few roads out of the area, San Onofre actually cuts in half the main evacuation route needed in case of an accident at the plant! That is, the plant itself is located so close to the freeway that ANY accident at the plant will close I-5 immediately, and probably I-15 as well. Meanwhile, the plant itself has been on restrictions and tightened inspections for years now because of worker apathy, anxiety, and audacious arrogance: They faked safety inspections, fire inspections, security inspections, and medical claims, work records, time sheets, and, of course, worker's own complaints were filed in the "circular" file or actually given to the supervisor about whom the complaint was filed -- the LAST person who should be seeing the complaint! Now, these guys are all scared the power plant WILL actually be shut down! They put on a brave face, but scratch the surface, and you find out they are being told not to talk to the public, not to talk to reporters, not to talk to the Nuclear Regulatory Commission unless they absolutely have too -- and WHY are they so scared? Never mind the lives that would be lost if there was a meltdown, or a spent fuel pool fire, or a dry cask fire, or all three, due to an earthquake, or a tsunami, or a power black-out, or all three. Never mind all that -- they are afraid they'll lose their jobs. The author, 55, has been studying nuclear power for about 40 years. He is a bladder cancer survivor, educational software developer, technologist, computer animator, survivalist, humanitarian and small businessman.